Franc Myles describes an above-ground archaeological project on North King Street. The ‘Archaeology of 1916’ project arose from a conversation held after an Archaeology Ireland AGM between the writer and Prof. Gabriel Cooney of UCD’s School of Archaeology. The concept, to investigate several flashpoints of the Rebellion as archaeological sites in the contemporary urban landscape, was based on a previous project undertaken by Archaeology and Built Heritage on the Moore Street battlefield. This offered a significant reinterpretation of the final hours of the Rising, mapping the withdrawal of the GPO garrison from what most consider to be the central locus of the rebellion, out into the warren of lanes and into a row of eighteenth-century houses to the north. The fieldwork placed a new focus on the civilian experience of the Rising, while a specific investigation of the built heritage quantified the survival of elements of a rebellion landscape that has been disregarded since the foundation of the state. Underpinning both projects was the idea that a specifically archaeological investigation of these sites has the potential to add to the received narrative of the Rising, to provide a more considered account of the conflict and its aftermath in the contemporary urban environment. The 1st Battalion area of operations (An tÓglágh, May 1926). Note the location of Clarke’s Dairy. Central to the project methodology was to treat each flashpoint as an archaeological site and to collect the evidence as if we were excavating trenches in the ground. This may appear an unusual endeavour, but the theory of using archaeological techniques in contemporary landscapes is one that has gained currency elsewhere. While traditional archaeological approaches usually involve the destruction of the evidence through excavation, the approach taken was to identify and interpret what survives today and to interrogate the received narrative of events. The project was funded by Dublin City Council, the Heritage Council and UCD, and was undertaken in conjunction with an undergraduate public archaeology module. Several of the participating students assisted in the fieldwork programme, which extended for ten weeks on either side of the centenary. ‘Live’ public outreach was an important element of the project and an engaged audience was built up on various social media pages, which in turn directed the public to the project website, thearchaeologyof1916.wordpress.com. Clarke’s Dairy. 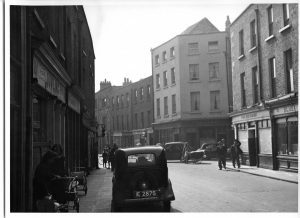 View south down Church Street c. 1950 (www.bureauofmilitaryhistory.ie) and today (Alva Mac Gowan). The sites were selected for what they can offer the researcher in terms of surviving physical fabric and the legibility of the surrounding urban landscape. Despite their being well documented in the historical accounts of the Rising, many of the sites are little known to those from outside their specific localities, while the actual narrative of the street fighting that took place at these locations remains less than fully understood, despite a plethora of recent publications. A methodology was established whereby a sound knowledge of the events at each location was acquired by the project team by interrogating primary source material such as the Witness Statements collected from surviving participants by the Bureau of Military History. Of particular assistance was a suite of photographs taken by the Air Corps in the early 1950s, which poignantly depict a city that has fundamentally changed. The sites were individually visited by the project team, working with contemporary photographs and the 1907 edition of the Ordnance Survey 25in. mapping. Surviving fragments of the landscape were photographed and mapped, and the deployment of opposing forces was worked out on the ground in order to gain a tactile appreciation of the events which took place from the mobilisation centres on Easter Monday to the final surrenders the following Sunday. Less well-understood flashpoints included the streets around Watkins’s Brewery on Ardee Street. This was an outpost abandoned by the Volunteers, not as a result of enemy action but on account of the opposition demonstrated by local people, encouraged by ‘Separation Women’ whose husbands were fighting on the Western Front or in Gallipoli. Fieldwork undertaken in the South Dublin Union (St James’s Hospital) recovered extensive evidence for repair, which gave a physical reality to the information contained in the files of the Property Losses (Ireland) Committee (PLIC). The Committee was established in the aftermath of the Rising to address the substantial damage to property that had occurred, so that businesses or individuals who had suffered losses could claim compensation from the government. The files have recently been digitalised by the National Archives, the latest in a series of archives now more readily available to the public, which include the Witness Statements and military pension files held by Military Archives. [3A] View westwards on North King Street towards Reilly’s Fort, c. 1950 (www.bureauofmilitaryhistory.ie). [3B] Reilly’s Fort today. The buildings on the right were tunnelled through by Volunteers. As with any landscape investigation, the discrete sites benefited from several visits, whereby an ostensibly familiar streetscape was de-familiarised and reimagined. The first site investigated was literally on the doorstep of the project office and extended from the old Broadstone station down to the Liffey at the Four Courts, encompassing the area as far west as Blackhall Place and as far east as Capel Street. the junction of Church Street and North King Street. It is significant that the initial reappraisal of the fighting has been undertaken by a local grassroots history group who have emphasised the civilian toll in the area, and the fieldwork coincided with the unveiling of a commemorative plaque to those fifteen civilians shot or bayoneted to death by soldiers from the South Staffordshire regiment in North King Street. Some of the bodies were hastily buried by soldiers in the basements of the buildings where the murders took place; these were all demolished in the 1970s for road-widening and this crucial sector of the battlefield has been lost. Indeed, it is striking that anyone under the age of 60 will have no memory of the general area around North King Street as it would have appeared in 1916, and in this respect this brings the area closer to a traditional archaeological site. Of all the sites to be covered in the project, this landscape is perhaps the most denuded in terms of its built heritage and historic vistas, while the widening of the principal road junction makes it very difficult to appreciate the intimacy of the fighting over the final hours as the outpost at Reilly’s Fort (which still survives as the Tap Bar) was being attacked from the east. The North King Street area, despite the substantial alterations to the landscape, nonetheless serves as an example of how much can still be recovered by undertaking a physical exploration in tandem with more traditional historical research. The project thus established the ‘real’ location of Clarke’s Dairy, a significant Volunteer outpost, and also identified a surviving section of the Linen Hall Barracks complex, whereas the received narrative had it completely burned down by Volunteers on the Wednesday of Easter Week. Clarke’s Dairy is annotated on all the published maps of the fighting as being located on the south-western corner of Church Street and North Brunswick Street. More recently published accounts of the Rising persist in locating the dairy to the west of Church Street, and the secondary accounts of what took place here are obviously influenced by this perception of its location. The Witness Statements are admittedly ambiguous as to the exact location of the dairy, although its strategic significance is accepted in all primary accounts. 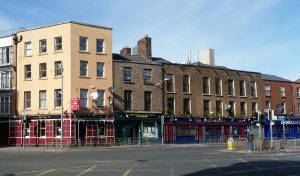 The positions on North Brunswick Street have an added significance in the narrative of the Rising, being the last to surrender on the Sunday morning, as the British, having taken Reilly’s Fort the previous day, had effectively cut off communications with the new HQ established in the Four Courts. An examination of the 1915 edition of Thom’s Directory does not list Clarke’s Dairy and indicates that the south-eastern corner of New Lisburn Street and Church Street was occupied by the Monks’ Bakery, while several of the Witness Statements place the bakery on the north-eastern corner of Church Street and North King Street. The PLIC files indicate that Thomas Clarke of 80 Church Street Upper claimed £53 for damage to stock and furniture; he was eventually granted £20. The four Air Corps photographs taken of Clarke’s Dairy in 1950 undoubtedly depict the structure described in several Witness Statements, and when they are examined with the 1907 mapping the strategic importance of the building becomes obvious. The three windows in its north-facing elevation provided an excellent field of fire against any British advance being made down Constitution Hill from their position at Broadstone, while the angle of fire from the windows in the west-facing façade dominated any attempted advance from the west along North Brunswick Street. The Witness Statements also specify that ‘loopholes’ were broken through on the north- and south-facing elevations, which explains how fire could be directed on Reilly’s Fort after its capture by the British. How is it possible that a site of such significance continues to be incorrectly mapped, since the landscape of the Rising was certainly extant when the Witness Statements were being collected in the 1950s? Yarn Hall: ‘Linenhall Barracks, Dublin, shelled’ (Keogh Photographic Collection, NLI), and the same view today (Alva Mac Gowan). The first account of the fighting in the North King Street area was published as three instalments in the journal of the National Army, An tÓglágh, in May 1926. It was written by John J. Reynolds, Curator of the Municipal Art Gallery, ‘from statements made to the writer shortly after 1916, by actual participants in the fighting’. Reynolds refers to the occupation of ‘Moore’s Coach Factory, a long low building at the corner of North Brunswick Street’, and states that ‘at Monks’ Bakery the high three-storey house, Clarke’s Dairy, opposite the coach factory was taken’. 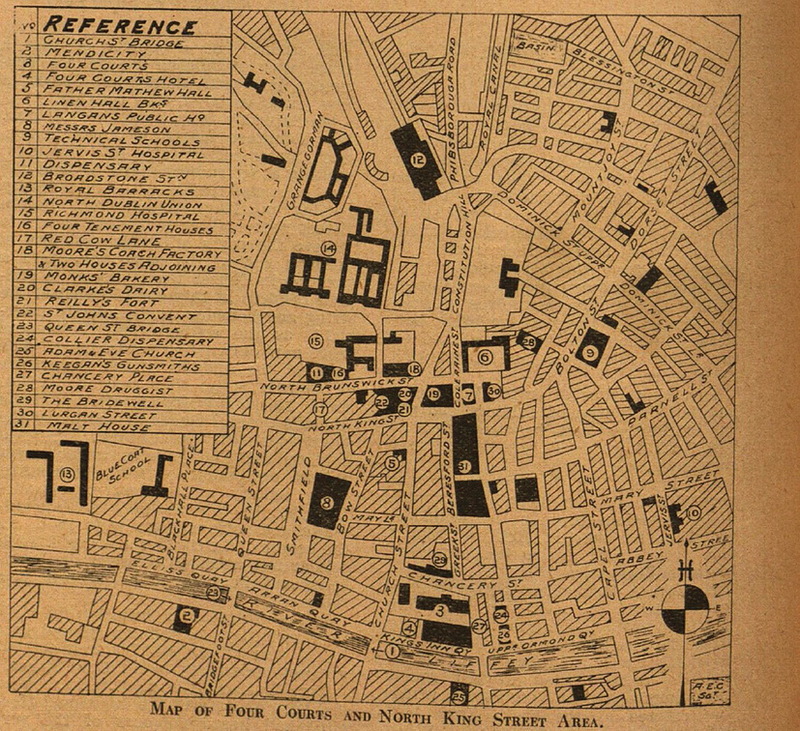 While the Witness Statement of Captain Nicholas Laffan, taken some 30 years later, specified that the buildings were diagonally opposite one another, the map published in the third instalment of Reynolds’s account places Clarke’s Dairy directly opposite Moore’s on the southern side of North Brunswick Street. All of the maps of the battlefield published since have perpetuated this mistake, and the accompanying narratives have followed suit. The building has long been demolished and its foundations, which presumably survive underneath the carriageway on Church Street, have now become an archaeological site in their own right. What possibly do survive, though, are the ‘tunnels’ documented in the Witness Statements which allowed access out of the firing line from Reilly’s Fort up to the junction with North Brunswick Street. The row of early nineteenth-century shops still exists and it is quite likely that similar evidence for repair work survives in the party walls as is evident within the Moore Street National Monument. On the 1907 mapping the site is annotated as the Linen Hall Bks (Disused), but in April 1916 it was at least partially occupied by the Army Pay Corps and was thus an obvious target for Republicans holding positions just to the south along North King Street. After it was captured and set on fire, the conflagration had the effect of illuminating the area to such an extent that it was difficult for the Volunteers to move around at night without attracting sniper fire from the surrounding British positions. The destruction wrought on the barracks is evident from the photographs taken immediately afterwards and serves to illustrate the effects of fire—as opposed to artillery—on the city’s built heritage during the conflict. Four of the photographs were taken by the antiquarian Thomas J. Westropp from Lisburn Street and the Lurgan Street entrance, while another was taken from the yard to the east of the main barracks complex, looking to the north-west across the range of buildings designed by Cooley in 1784. What, however, survives today of the original complex? The northern boundary of Burgh’s Linen Hall is still evident in the plot boundary to the rear of Linenhall Terrace against the Dublin City Council Housing Services yard to the rear of Coleraine House. The wall is of calp limestone with frequent blocked openings with brick reveals which accommodated windows and a doorway. The wall returns to the north behind the houses on Linenhall Parade before returning east again at the boundary to the King’s Inns. The most significant survival in the area is perhaps the remains of Thomas Cooley’s Yarn Hall, which, although not part of the barracks in 1916, was gutted by the fire started by the Volunteers. The claim made by Hugh, Moore and Alexanders Ltd was for £32,752-19s-4d, to cover the destruction of premises and property by fire at Linenhall, Henrietta Place and Bolton Street. A payment of £20,500 was recommended by the Committee. While the building appears to have been substantially gutted, the walls survived at ground-floor level at least, and the rusticated arcading is evident today under a heavy render on the DIT School of Architecture. The arcade on the southern elevation makes a partial appearance on a photograph in the collection of the NLI, while the roofless remains of the eastern portion of the Linen Hall are evident in the background. The arcades have been filled in to create arched window opes, which survive along the entire frontage on the elevation shown below and, indeed, in the northern elevation, where they are now within the extended building. 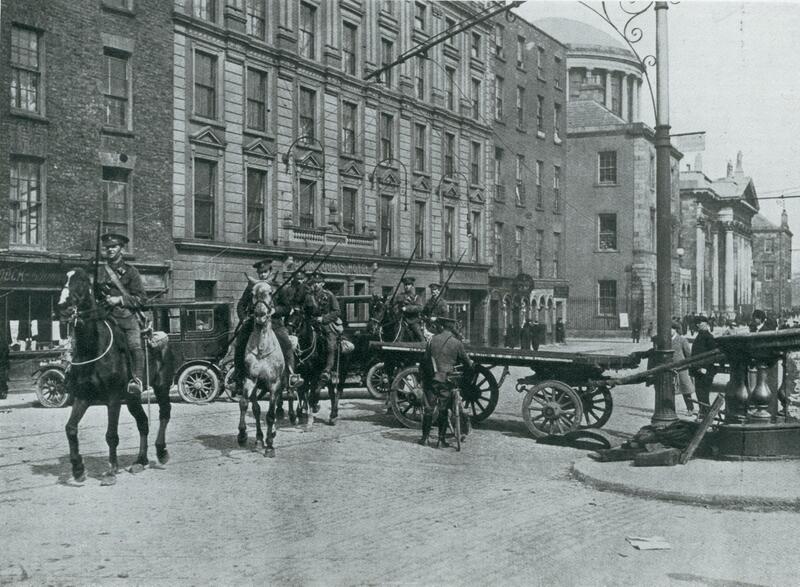 Lancers pass through a barricade on Inns Quay in the immediate aftermath of the Rising. In the aftermath of the Rising, photographs played a key role in shaping memories of the event. In addition to press photography, postcards were a popular medium for the circulation of photographic images. Among the UCD Curran Collection is an assemblage of postcards published in 1916 shortly after the Rising. The images, focused tightly on the area around O’Connell Street, document the dramatic damage inflicted on the iconic street. Prominent, too, are photographs of barricades. The images typically depict uniformed British soldiers posing with their weapons. The barricades themselves, thrown together from carts, drays and household furniture, capture something of the disruption of the episode. Barricades were central to the strategy of the 1st Battalion in the North King Street area. The network of narrow streets and lanes extending north from the Four Courts was easily blockaded, and the industries and building yards dotting the area provided ample materials for the purpose. The barricades were built with a variety of materials taken from adjoining houses, stores and yards, including barrels, boxes, carts, cabs, old furniture, planks, sacks filled with sand and rubble. On North Brunswick Street, Glynn’s and Cullen’s building yards were raided for cement, sandbags and building material. Further south on Church Street, rubble and timber from ruined tenements and materials from an adjacent building site, the location of the collapse of several tenements in 1913, were used to build ‘a massive brick barricade’. The Volunteers recruited men from the crowds queuing at the Monks’ Bakery to carry materials from the building site to nearby barricades in exchange for bread. This less-tangible evidence for the fighting in the area was recovered from the PLIC files, where compensation claims can be mapped as clusters around the barricades, the exact location of which are not readily identifiable from the Witness Statements. When the locations were pinpointed, the fieldwork identified several bullet strikes, thus extending the physical survival of the evidence away from the main points of conflict. The most immediate outcome of the project will see the results presented on a GIS mapping system which will collate the documentary sources with historical and contemporary images and other material touching on the subsequent commemoration of the Rising, such as public sculpture. The project has succeeded in establishing the Rising as a city-wide event: despite the ravages of later twentieth-century development, the physical evidence of the conflict still survives in places as diverse as the underground car park to the rear of the NAMA headquarters or in derelict buildings such as the Irish National Foresters’ Hall behind Parnell Square. As the Decade of Commemorations continues towards the War of Independence and the Civil War, there is certainly potential to expand the historical narrative to incorporate a much broader investigation of the more tactile evidence for the conflict in the physical fabric of our towns and cities. ← Showing the archaeology of Ireland in one map?